Everton have always been one of the sides I enjoy writing about as over the past couple of seasons they've had a pleasing blend of both ability and predictability, all while often flying under the radar of the masses.1 For the most part those trends have continued this year with a solid back line and talented front man, although there isn't really a target player in midfield as we've had in the past with the likes of Arteta, Cahill, Pienaar and Fellaini. 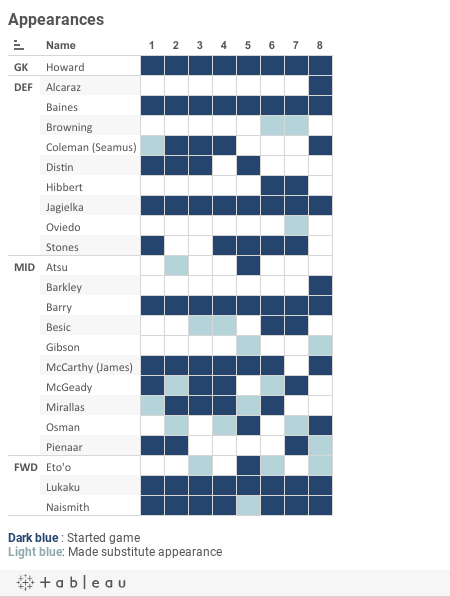 Starting at the back, we have Howard, Baines, Jagielka and Coleman absolutely locked into their respective positions, with at least threee of those options offering about as much security and low upside as you're going to find among premier league starters. We'll get to a comparison of the defenders potential weighed against their price in the next stats post but for now we can conclude that they are all essentially as safe as each other. The last man in when healthy is probably Stones but with the youngster sidelined for a couple of months, Distin probably has the inside track on that final spot. At 5.4m he doesn't offer enough of a discount to be interested in, but one name to watch is Alcaraz who made his first start this week. At 4.3m he does offer an interesting discount to his team-mates and might be worth bearing some risk for if you believe he has a good shot at holding onto that job. For now, all indications seem to be that Distin will return when healthy but it's a situation worth monitoring. This midfield isn't without talent but with Mirallas and Barkley sidelined it really lacks star power, especially with Pienaar regressing as the miles start to take their toll. Barkley returned this week but has a sizeable price tag (6.7m) to live up to, which is possible but by no means guaranteed based on his somewhat up and down play to date.2 Still, Lukaku reckons he's the best player in the team which is quite high praise considering his teammates and with his season slowed by injury, he's under everybody's radar right now and thus has the makings of an differentiator when he returns to fitness. Again, we'll look at attacking potential in the next post, but in terms of job security we see that Barry and McCarthy has essentially been ever present in the middle with Osman, Naismith, Barkley, Pienaar and McGeady vying to provide the attacking options to support Lukaku. Aside from the potential of the aforementioned Barkley I'm not sure any of this midfield group have the reliability and underlying data to warrant serious interest, as reflected by their generally minuscule ownership numbers. One exception to that latter point is Naismith whose 5.2 price tag has caught the eye of many an owner, and based on playing time alone that appears to be a fair move.3 This lineup is perhaps a touch less reliable than in past years, mainly due to injuries to Barkley and Mirallas, yet with the replacement group not really standing out, it doesn't appear there is too much to be overly concerned about until that duo return. At the back they remain one of the best options around and Lukaku is still one of the remaining, genuine every week starters with enough upside to justify a lofty price tag. A few people might be wondering why you're reading about Burnley and Everton rather than Man Utd and Chelsea or even Tottenham and Newcastle. One factor is that this is the only televised game these two teams are in for the next couple of months but the more pressing factor is that I simply haven't seen Burnley play this season - other than oft-abbreviated highlights - and really need to get a handle on them as I've found decent value in the less heralded promoted sides in the past. Luckily for me, and potentially fantasy owners, Sean Dyche seems to have a first team in mind and to date hasn't shuffled his deck too often. The midfield has a few interesting options but could present some selection questions when everyone is healthy. Arfield has been ever present to date while the likes of Boyd, Marney and Jones have generally played when available. Kightly came into the side when Marney went down and has since played reasonably well by all accounts and provides from natural width that teams crave, and is important in the formation Burnley appear to favour. Boyd's playing time, position and price tag look promising and Marney - someone who had caught my eye in the opening games - is set to return soon after being sidelined for the last three gameweeks. Arfield meanwhile leads the team in fantasy point giving us plenty to look at in the data and this week's game. Up top we have a team who look to be committed to playing two front men with highly rated Danny Ings and new arrival Jutkiewicz looking generally locked into the first team. My concern would be that after a good defensive start to the year (at least in terms of goals conceded if not underlying process), the team has started to ship more goals of late and one response would be to lose one of their front men and try and play tighter. Such a move could render both players too risky to own, although at least their price tags remain attractive. Gun to your head you'd expect Ings to play more often than not, but with talk of him wanting out of the club, it wouldn't be amazing to see Jutkiewicz preferred which makes it tough to really commit to anyone here. Good stuff Chris. Lukaku was one of my favorite players the last couple years, but looking at the data I'm not sure he warrants the premium required over Pelle and Welbeck.